Manager Dave Martinez said he talked to Turner about attempting to steal more bases in 2019, Jesse Dougherty of The Washington Post reports. Turner racked up 43 stolen bases -- good for second most in the majors -- in 52 attempts last season, but Martinez apparently wants the speedy shortstop to be more aggressive on the basepaths in 2019. 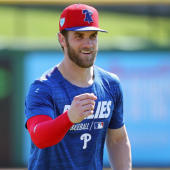 When all is said and done, the hope is that Turner finishes with closer to 75 or 80 stolen base attempts this season, which would only make the 25-year-old more valuable after he chipped in a career-high 19 homers while hitting .271 across 740 plate appearances in 2018.